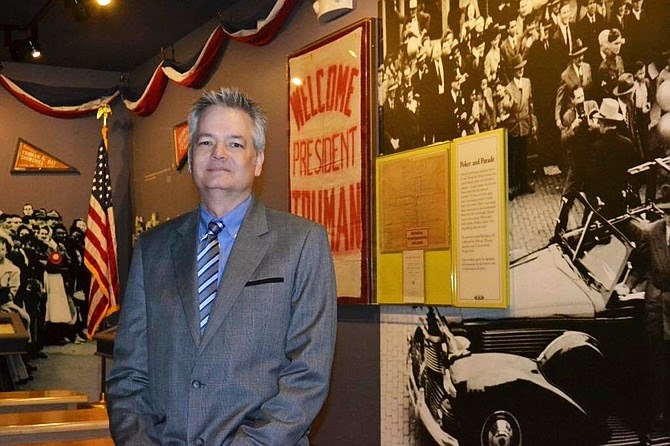 James Williams, formerly the director of the Albert Gore Research Center in Tennessee, was recently appointed as the director of the National Churchill Museum. When asked his vision for the National Churchill Museum, newly-appointed Director James Williams couldn’t give a short answer. His long list of ideas all possessed a common theme — extending the words and lessons of Winston Churchill to as many people as possible. “There are so many people out there who admire — even love — Winston Churchill and we need to find ways to connect with them,” Williams said. Williams, a 1986 Westminster College graduate, has returned to Fulton, taking over the position after Rob Havers left in April. He comes from Middle Tennessee State University where he was the director of the Albert Gore Research Center, which acts as an archival and educational organization as well as a museum, for six years. His duties included fundraising, program and grant writing and budget management. Williams was also a history professor at the university. Educational programming is key in Williams’ vision to reach more people — young people in particular. Williams said he hopes to someday develop a curriculum for teachers and, because Churchill was a multi-faceted person, the topics can vary from politics and government and history to writing, music, art (Churchill was an avid painter) and even math (Williams used the example of students measuring the Church of St. Mary Alderbury). Churchill’s personal story, which is outlined in the museum in depth, can serve as a life lesson as well, Williams added. “For a ninth grader in Callaway County, the lesson can be about determination, adversity,” he said. Because the museum has national status, Williams has dreams of living up to that — developing an interest in Churchill from east to west. As Havers did as director, Williams plans on traveling cross country to give Churchill talks. He’s also thought of creating a motor home with Churchill’s image to travel state to state. Children could go inside and learn more about the leader. Within Missouri, Williams eventually would like to see a staff member in St. Louis and Kansas City, heading educational programming in those cities. “There are so many ways to broaden what we’re doing,” Williams said. While he wants to bring Churchill to others, Williams also wants to see museum visiting numbers spike. He said about 18,000-20,000 people visit the museum annually, but increased efforts in marketing and tourism will hopefully attract more visitors. For schools, field trips can be an infrequent occurrence, but Williams hopes to secure funding for traveling costs to aid Mid-Missouri schools. Williams’ interest in former President Harry Truman helped guide him to his fascination for Churchill. Growing up in the Kansas City area, Williams attended Harry S. Truman Elementary School and his father once met Truman at their local masonic lodge. He worked as a park ranger at the Truman Home in Independence, and researched Truman’s wife’s family. As a Westminster student, Williams wrote his senior thesis on the Churchill Memorial and was a tour guide for the museum. Williams called the museum’s appeal “magnetic,” which may have something to do with how the museum exhibits who Churchill was not only as a historic political leader, but as a person. “To me, it’s the inspiration of how he tackled problems and could see the big picture,” Williams said. Williams holds a bachelor’s degree in history from Westminster, a master’s degree in Colonial American History from the College of William and Mary and a Ph.D. in Early American History from Vanderbilt University, according to a Westminster press release.